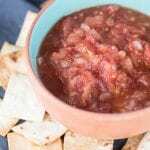 This 10 Minute Vitamix Salsa can be whipped up in 10 minutes or less! 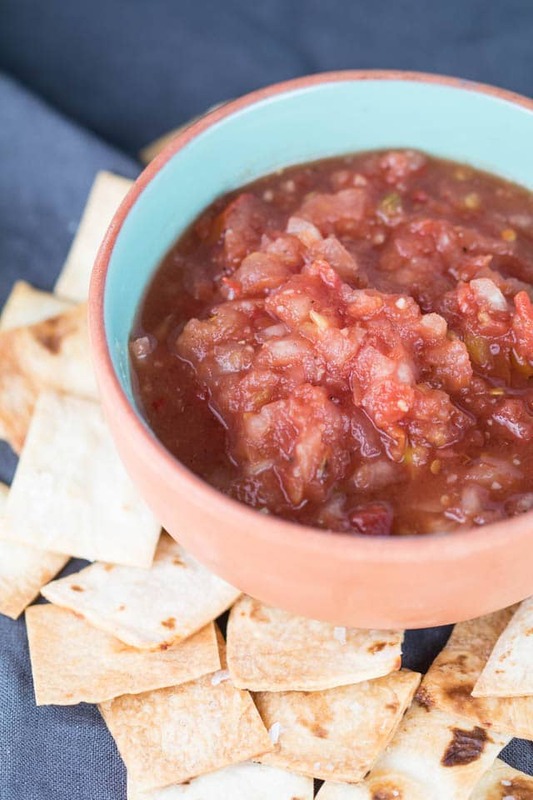 In the height of tomato season, this salsa is a must – plus with homemade tortilla chips you can’t go wrong! I’ve been trying to be more mindful of ways to preserve fresh veggies and herbs I buy. For example, one way to extend the shelf life of your asparagus is to cut about an inch of the ends off and place them in a mason jar with water. Don’t fill the water all the way up – about half way is plenty. Then, tent a ziplock baggie over the top and store this way in your fridge! You can easily get another week out of the asparagus. And it just looks pretty! You can also use this method with fresh herbs as well. How many times have you bought parsley, used 1/4 cup of it and the rest gets nasty and mushy in your drawer?! Even with the crisper drawer things go bad quickly. 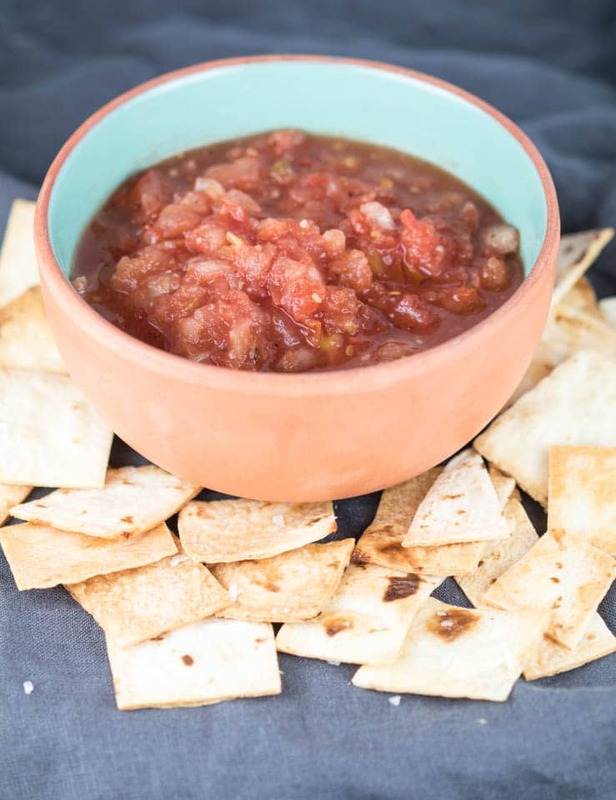 I raided my pantry to see what else I could use in this salsa because I knew the 1 large tomato would not be enough. I ended up having 2 cans of diced tomatoes. One was no salt added diced tomatoes and the other was diced tomatoes with chilies in it. I ended up using both because I did not have jalapeño on hand either so the spices from the chiles was perfect! My point to all of this is there is always something you can create with what you have on hand. That is the fun part about cooking to me. Being able to create. I also had some leftover tortillas from a taco skillet I made earlier in the week and I don’t eat flour tortillas very often so this worked out great! To make the chips I preheated the oven to 350 and lined a baking sheet with foil. Place the cut up tortilla flat on baking sheet, making sure they don’t touch each other. Brush on canola or vegetable oil lightly on both sides, and sprinkle with salt. Bake for 10-11 minutes and let cool. YUM! No frying going on in my house with these chips. What have you made with items on hand to reduce food waste? I’d love to hear some of your ideas! 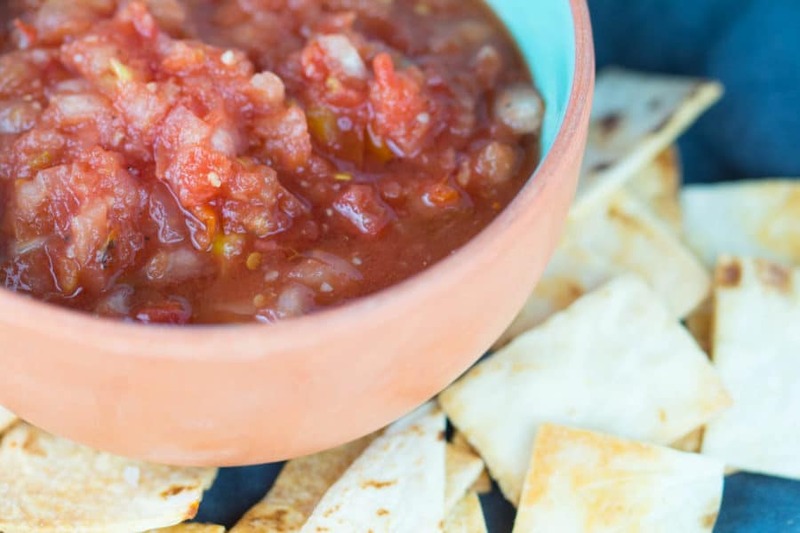 Spicy, bright and fresh this 10-Minute Salsa is a staple to have on hand! 1 can diced tomatoes with green chilies I used Rotel 10 oz. fresh garlic - 3 cloves or 1 Tbsp. 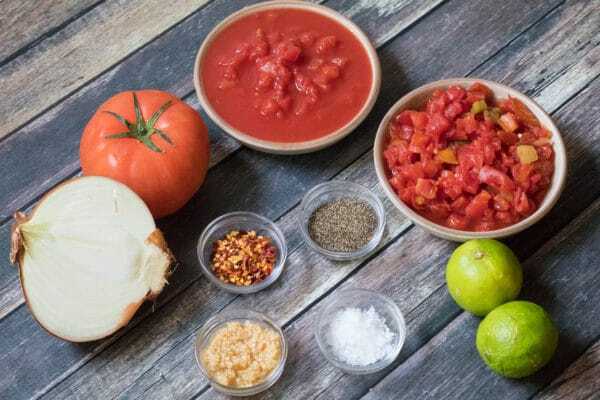 Place all ingredients into a powerful blender, like a Vitamix, and blend until desired salsa consistency is achieved. Cilantro and jalapeno recommended if you have it on hand! Click this Recipe Redux image below to see all of the other recipes made for this months theme! This looks super easy! So easy, my non-cooking husband could do it! lol Looks great Tawnie! haha YAY! Thanks so much Lindsey! <3 Have a great weekend!